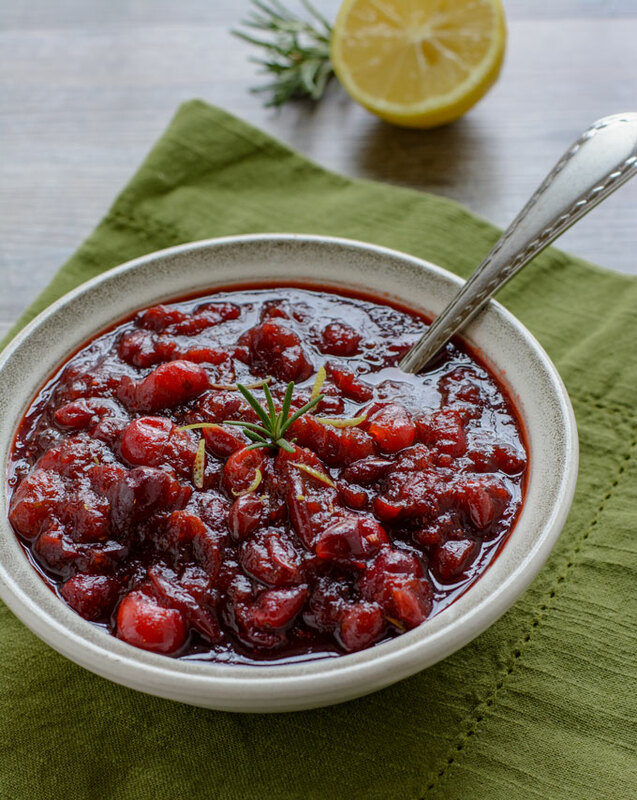 This Fresh Cranberry Sauce is super easy to make and SO much better than the canned stuff! It’s naturally sweetened and infused with the fresh flavors of lemon and rosemary. Growing up, the only cranberry sauce I remember eating was the kind from a can. I can still recall the sound it made as it fell out the can. Schloop! My mom would cut the canned-shaped jellied sauce into slices, and it was served on the same glass dish each year. Recently, I decided to try my hand at making some homemade cranberry sauce using fresh cranberries. I had no idea how easy this is to make! There are lots of fresh cranberry sauce recipes out there, but I was intrigued by the ones calling for Rosemary. The hint of fresh herb flavor added a nice dimension to the dish. It’s a very subtle hint of rosemary that doesn’t overpower the cranberry sauce. The addition of lemon adds a brightness to the dish, but you could also substitute orange zest and juice. In a medium saucepan, add sugar, lemon juice and water. Bring to a boil, stirring to help dissolve the sugar. Add the cranberries and rosemary to the pan and stir to combine. Reduce heat to medium-low and simmer for 10 minutes. The cranberries will pop as they cook. Remove from heat, stir in lemon zest and let cool. I used coconut palm sugar to make mine, which is brown in color. That’s why it looks a little darker than most cranberry sauces. You can use regular sugar at a 1:1 ratio if you prefer. The addition of lemon zest adds a brightness to the dish, but you could substitute orange zest. When stored in a tightly covered glass or plastic container and continuously refrigerated, cranberry sauce should keep for 10-14 days. 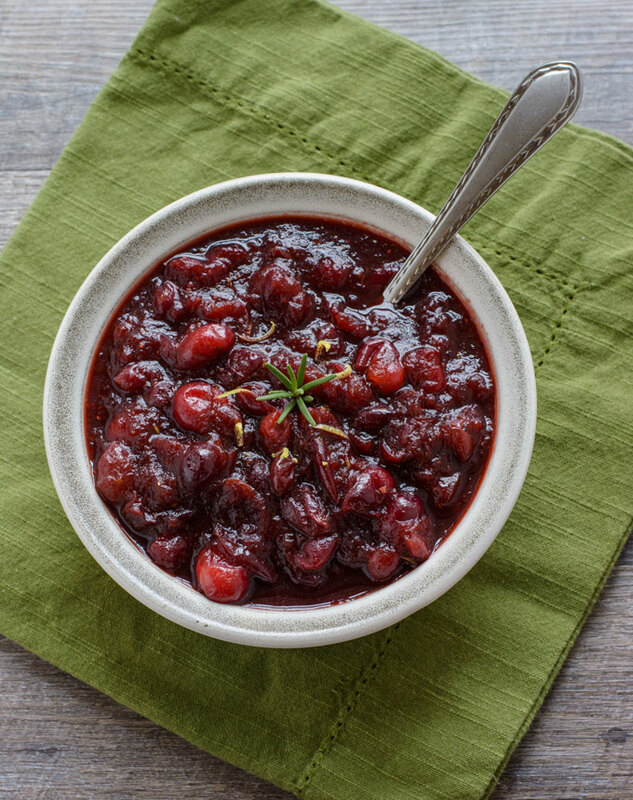 Save this Fresh Cranberry Sauce Recipe to your “Side Dishes” Pinterest board! Forget the canned stuff! 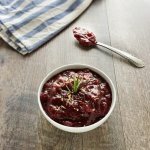 This naturally sweetened Fresh Cranberry Sauce is so much tastier and better for you! Zest and juice your lemon. In a medium saucepan, add the sugar, lemon juice and water and bring to a boil, stirring to help dissolve the sugar. Add the cranberries and rosemary to the pan and stir to combine. Reduce heat to medium-low and simmer for 15 minutes. The cranberries will begin to pop as they cook. Remove from heat, stir in lemon zest and let cool. The sauce will continue to thicken as it cools. If it's too thick for your liking once it has cooled, you can add a little water until you reach your desired consistency. Can be served cold or at room temperature. Update Notes: This post was originally published in November of 2016, but was republished with an updated recipe, new photos, and new tips in November of 2018.